Sewing is life. Life is art. This one is for the quilters. If you are not already using them, these simple little clips are just the best thing since sliced bread. Made by Clover, you can probably purchase Wonder Clips anywhere online and certainly in your local quilt store. They are like the invention of the post-it or the paper clip. So simple I want to slap my head and say why didn’t I think of that? Of course, they are nothing more than tiny clips made the perfect size to fit on a quilt binding. I will never use pins again on a binding, as these are so easy. And I just hate to be someone who endorses product because heaven knows, no one is paying me for the endorsement. But doggone it, go get yourself a stack of these for your next quilt. No getting stuck by the pins as you stitch on the binding, no bending your pins because the quilt sandwich is too thick. Just move these little guys along as you go. Easy as pie. There. I did my good deed for the day. 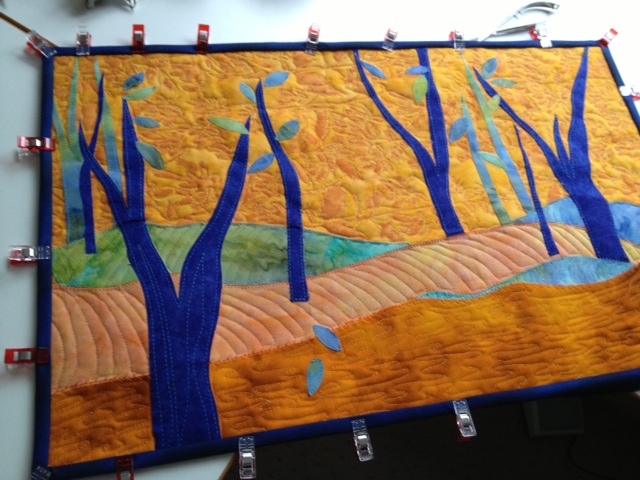 This entry was posted in landscape, midwest, quilting, tips and tagged binding, wonder clips. quilting by edges. Bookmark the permalink.